Werner's Cairns blog: Germany Debates Muslim Immigration. Most Australians will be able to relate to the problems encountered in Germany and Europe. Ironically; in the immediate post-war years, Germans migrated to Australia in droves.To fill the gap of badly needed workers in the German booming economy, caused by out-migration of Germans. They invited “guest workers” from Islamic Turkey, to settle temporarily in Germany, and they had similar treaties with Greece, Italy and Spain, but they were insufficient to supply Germany's seemingly endless demand for labour. By the end of 1969, more than one million Turkish "guest workers" had arrived in Germany to work in the "host country's" industrial zones. The initial idea was that the Turkish labourers would return home after a period of two years, but the so-called "rotation clause" was removed from the German-Turkish treaty in 1964, partly due to pressure from German industry, which did not want to pay the costs of constantly training new workers. The predictable result was that many Turks never returned home. Germany is now awakening to the fact how foolish it was to overturn the "rotation clause." Europe has learnt the hard way of the problems Muslim migrants can bring to their respective countries. They are trying now to shut the gate after the proverbial horse had bolted, (We keep it wide open), but they are realising now (too late) that once you have noncompliant migrants in the country it is very hard to get rid of them. We in Australia are at present bursting at the seams with illegal “migrants” arriving in boatloads and uninvited, most, or all of them are Muslims. Will we learn from the German Experiment? The slogan “populate or perish” is perhaps still having relevance in our country today, but it is imperative that we must select migrants that are willing to adapt and integrate into the Australian society, otherwise our culture will “perish” and another will come into place, which most of us would not be happy with. It is time we take our blinkers off, and that applies in particular, to our politicians. For the record: To what religion, or race a person belongs to, has no bearing on me whatsoever; I judge people on their merit and their attitude and not their religion or race. I never had a problem with employing and training aborigines. Can Islam and (we) Australians infidels form a close-knit homogeneous group in our country? What do you think? A national debate is raging in Germany over Muslim immigration. 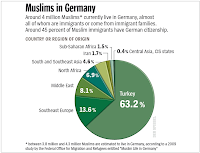 The issue is drawing attention not only to Germany's broken immigration system, which for many decades now has failed to integrate Germany's Muslim population, but also to Germany's demographic time bomb, which is significantly accelerating the pace of Muslim immigration. Click on picture to enlarge. The debate is also exposing deep rifts between Germany's politically correct elites, who for years have tried to silence discussion about Muslim immigration, and vast numbers of ordinary Germans, who are becoming increasingly uneasy about the social changes that are transforming Germany, largely due to the presence of millions of non-integrated Muslims in the country. The debate over Muslim immigration is being fuelled by an explosive new book titled "Germany Does Away With Itself." The best-seller, authored by 65-year-old Thilo Sarrazin, a prominent German banker who is also a long-time member of the center-left Social Democratic Party (SPD), has broken Germany's long-standing taboo on discussing the impact of Muslim immigration by highlighting painful truths about the current state of affairs. Apprehension about the future explains why Sarrazin's concerns over Muslim integration are resonating with the German population at large. (Sarrazin's book has topped the bestseller list on bookseller Amazon's German website since its publication in late August, and book tour dates are sold out across the country.) Polls show broad public support for Sarrazin's anger that many Muslim immigrants shut themselves off from Germany, do not speak German and do not share the German and European worldview. According to a recent survey conducted by TNS Emnid pollsters, around 20 percent of German voters would back a hypothetical political party led by Sarrazin. Another poll conducted by the mass-circulation Bild am Sonntag shows that 89 percent of those surveyed say Sarrazin's arguments are convincing. "For them, Sarrazin is somebody who is finally saying what many are thinking," according to Emnid. This worries the uppity guardians of German political correctness, who have tried to silence Sarrazin by getting him removed from the board of the German central bank, the Bundesbank, and expelled from the Social Democratic Party. Infuriated by Sarrazin's audacity to question the status quo of German multiculturalism, the bulk of Germany's political and media class has been working overtime to delegitimize Sarrazin as a "racial arsonist." "In every European country, due to their low participation in the labor market and high claim on state welfare benefits, Muslim migrants cost the state more than they generate in added economic value. In terms of culture and civilization, their notions of society and values are a step backwards." "No other religion in Europe is so demanding and no other migration group depends so much on the social welfare state and is so much connected to criminality." 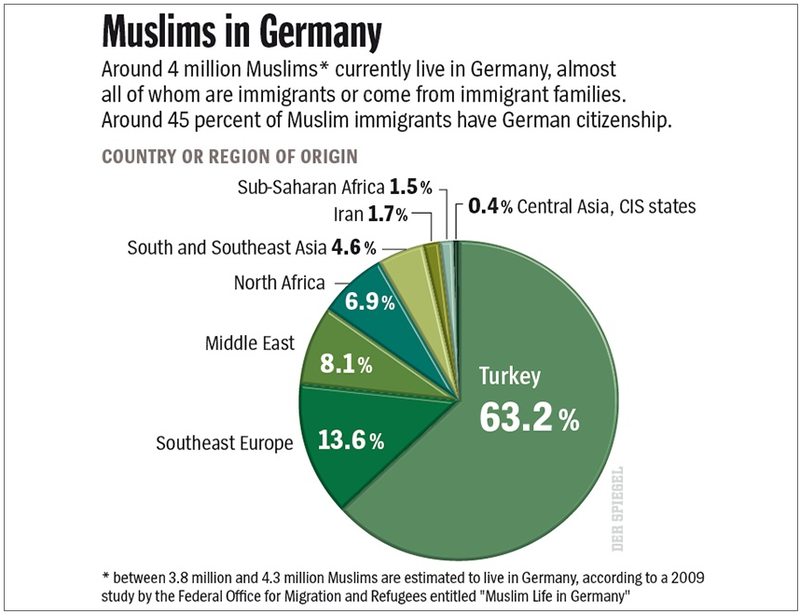 "Most of the cultural and economic problems [in Germany] are concentrated in a group of the five to six million immigrants from Muslim countries." "I do not want my grandchildren and great-grandchildren to live in a mostly Muslim country where Turkish and Arabic are widely spoken, women wear headscarves and the day's rhythm is determined by the call of the muezzin." "If the birthrate of migrants remains higher than that of the indigenous population, within a few generations, the migrants will take over the state and society." "I do not want us to end up as strangers in our own land, not even on a regional basis. From today's perspective, the immigration of guest workers in the 1960s and 1970s was a gigantic mistake." Thank you for that very interesting but disturbing reading. Dear God, what is wrong with us that we feel we have to 'tip-toe around the tulips' as far as Muslim Immigration is concerned? The civil libertarians (world-wide) are truly wearing blinkers because they fail to see that their misguided advocacy to allow refugee status to these people is in fact giving the Muslims carte blanche to surreptitiously take over one democratic country after another. Why are we wasting money and precious lives over in Afghanistan when it is plain to see that it is another no win war. The Muslims over there must be laughing in their fists that they're keeping us occupied in this endless war. Not only is this war robbing us of good men and women but it is also costing us a fortune to maintain our presence over there. Well I've put in my two cents worth...I could go on and on. Thank you for this interesting article. Islam and Australia are not compatible; they won’t mix just like oil and water. What I read is that Islam is not a peaceful religion and that is manifestly demonstrated all over the world. Muslim women are virtual slaves for their men and have no rights. Why do they want to come to Australia? 1. They are looked after by our welfare system, which would not happen in a Islamic country. 2. They breed like rabbits and their aim is to multiply to the extent to have eventually enough people here to get an Islamic political power-base here – and then God help us. Will our politician ever wake up to the problem they have in Europe with Muslims? The answer is unfortunately no, they are too pre-occupied with feathering their own nests and work toward winning the next election. The Federal court case in Melbourne should tell us a powerful message about Islam in Australia. A number of Australian Muslims wanted to attack an Australian Army base. I fear for my children and grandchildren and the future, if our politicians haven’t got the intestinal fortitude to stem the Muslin tide coming to our country. Send them all to a Muslim country we have enough trouble here without them. A Lebanese Christian woman talks about Islam. “Warm, Watered and Well Fed is Better”.